A useful poster, particularly if you've got older children but worth knowing about anyway! Although we have had no issues about 'Fortnite' in school, it has been in the spotlight somewhat over recent months in the media and talked about a lot over Social Media. The Safer Internet Centre have some really useful advice for parents about the game. Take a look by clicking the link below. Due to children's comments in school and concerned tweeters, we have addressed the issue in an appropriate way for appropriate children. Thank you for your support Tweeter and all of our parents! The NSPCC have reported that they have been contacted by scared children over 'clown' reports. Please visit their site for information on supporting your children at home. As part of our Online Safety work, we will be ensuring children are appropriately educated on keeping themselves safe and what to do if they have any concerns. 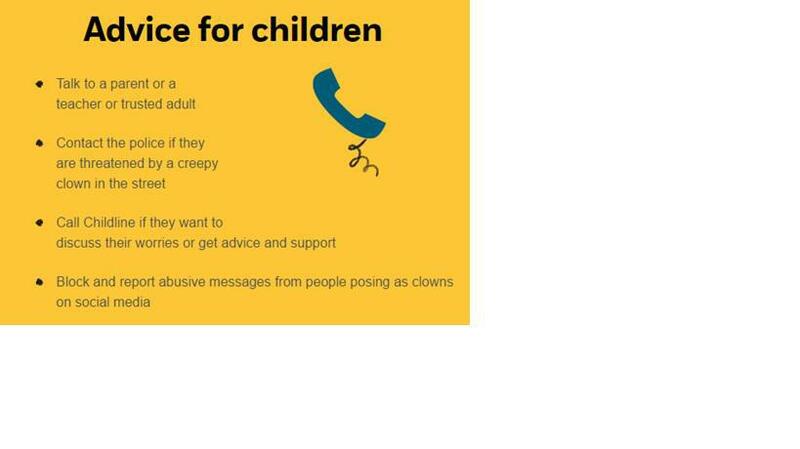 See the advice for children from the NSPCC below. As we are all aware, the age restrictions to use social media are currently 13 years old but please use the advice which is needed for your child.